I've got the studio documentation for this cartoon, but for some reason, it doesn't include animator credits after scene 24. Clearly a studio oversight. Thad K. and I have put our heads together to figure out the rest of the scenes. There are scenes where we are in strong agreement (30 through the end), but scenes 25 to 29 are a bit iffy, which is why I listed more than one animator as a possibility. If this whole sequence is Moore, it is not Moore at the top of his game. There are poses and bits of timing that suggest Moore, but they are not strong enough to negate the possibility of Thad's suggestions of Les Kline, Laverne Harding or even Ken O'Brien. 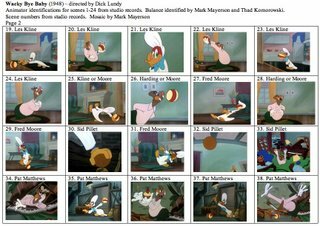 I see some Moore-ish poses even in scenes that the document identifies as Les Kline, so perhaps Lundy had Moore do character layouts for other animators, which would explain some of the confusion if it was the case. If anybody would like to offer an opinion, please comment. Lundy is casting strongly by sequence here. Ed Love gets the entire opening. Les Kline gets the start of the ball sequence, which is finished up by Moore and/or Harding. Pat Matthews gets the wild action for the climax, with Moore finishing up with the end gag. I had the pleasure of getting together with Bob Jaques a few weeks ago and he was laughing at the story for this cartoon. How absurd is it that Wally wants to adopt a baby and then decides to blow up his child with dynamite? I often wonder how interested Lundy was in stories at all. His Lantz cartoons give me the impression that he'd take any story he was handed and then spend his efforts to make it as attractive as possible. I don't get the sense that he was able to punch up a weak story or pull it into shape. Besides that, he was more partial to fall guy characters than he was to hecklers. Lundy's Donald Duck and Barney Bear cartoons confirm this. In this cartoon, he seems more interested in Wally Walrus than he is in Woody. After initially fooling Wally into thinking that he's a baby, Woody really only does one thing to go after Wally, and that's throw the metal ball from the andiron at him. Wally is the one who provokes it with the trick ball and Wally is the one who puts dynamite into the trick ball he knows will always come back. All Woody has to do is watch Wally destroy himself. If the pleasure of watching a heckling character is vicariously getting our aggressions out, this cartoon isn't very satisfying. I was wondering who animated the opening scene on the bench. The only copy of this short I have is a cheap AVI without the credits. I've come to really enjoy the backgrounds in Lantz' cartoons around this time. Do you know who did them? Sorry, Kevin, I should have included credit information. Fred Brunish is credited for backgrounds. The story is by Ben Hardaway and Jack Cosgriff. Music is by Darrell Calker. 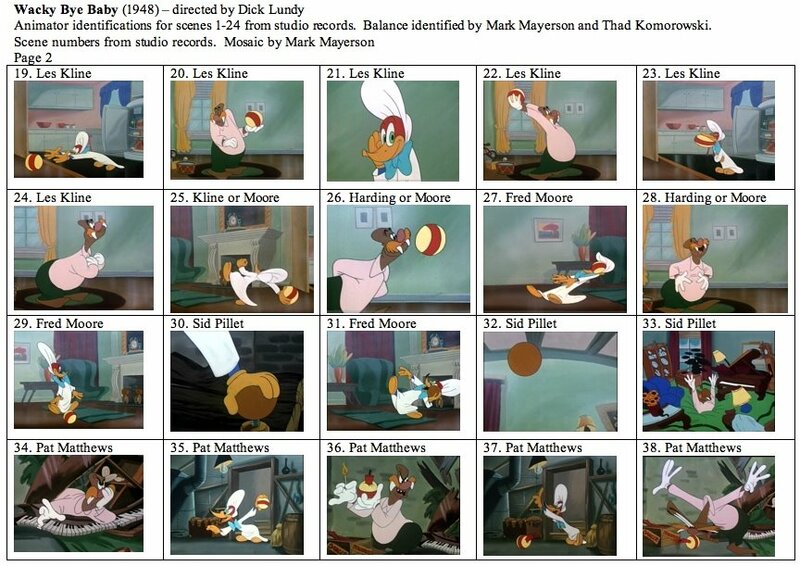 The credited animators are Les Kline and Pat Matthews. 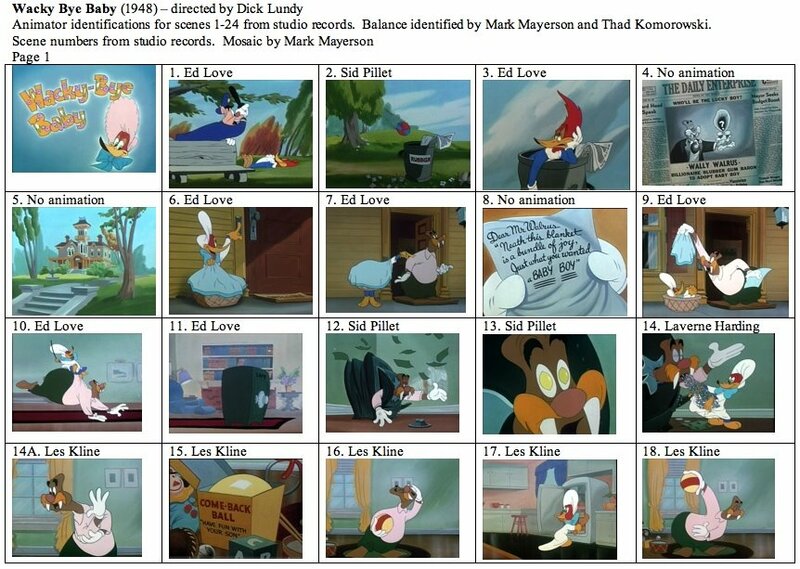 It's a shame that this late in the day, Lantz credits were so incomplete. Only two animators got credited and nobody ever got credit for the voices. Lundy was able to makes Klines`drawings look good!